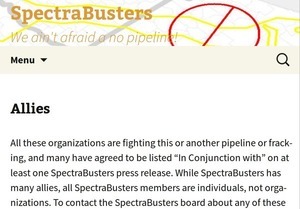 If your organization is actively opposing Sabal Trail or promoting solar power, you can send email to spectrabusters@gmail.com with a link to your organization’s web page and ask to be listed on the SpectraBusters Allies web page. If you’ve got a relevant motto, mission, or quote, or a link to a recent action, please include those in that email as well. 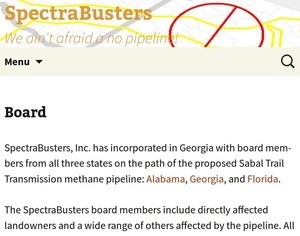 If you’d like to help organize against that unnecessary, destructive, and hazardous fracked methane pipeline boondoggle, you can apply to be on the board of directors of SpectraBusters, Inc. To apply for the SpectraBusters Board, send email to spectrabusters@gmail.com saying who you are, what you have already done to oppose Sabal Trail, some references of people who know you and what you have done, and contact information (your telephone, email, and other contact handles). For three years Sabal Trail claimed it had to finish by May 2017. Now, depending on which latest newspaper publication by Sabal Trail you read, they’re planning on June, or maybe even August. No matter which date, that’s only a few months away. Let us all work together to stop this boondoggle and to get the Sunshine State to go solar now, along with Georgia, Alabama, and the rest of the southeast, the U.S., and the world.